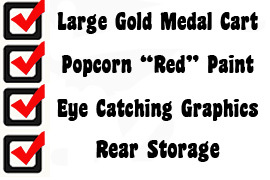 Gold Medal's 2121 Econo Pop popcorn machine is a sturdy popper that has a heavy duty kettle and tempered glass windows along with a 14oz removable aluminum kettle The Gold Medal Econo Pop 14 could be the fastest and most economical popper offered. 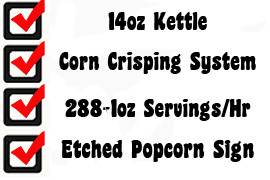 Standard features Includes a built-in corn crisping system to keep popcorn fresh longer than your average popper. A bright red powder coated steel dome along with a two color etched popcorn sign on the window. 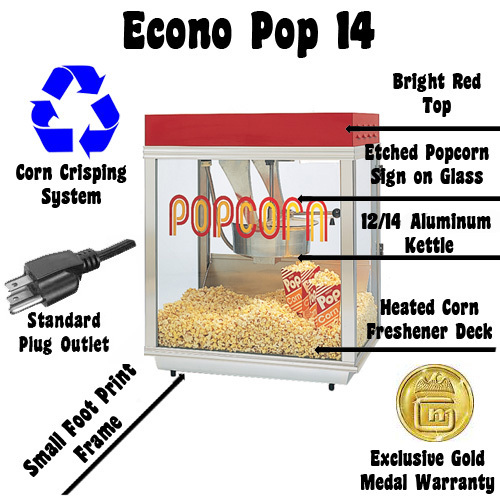 Super low pricing and high popcorn output is why customers truly enjoy their Econo Pop 14 #2121 Why wait? Order yours today! Heavy-duty cast aluminum kettle, twin cast aluminum hanger arms, heavy welded and satin anodized frame, powder coated steel dome and attractive "Popcorn" letters etched into the front glass. The Econo 14 popcorn maker plugs in virtually any 20 amp outlet. Unique"POPCORN" etched on front tempered glass.